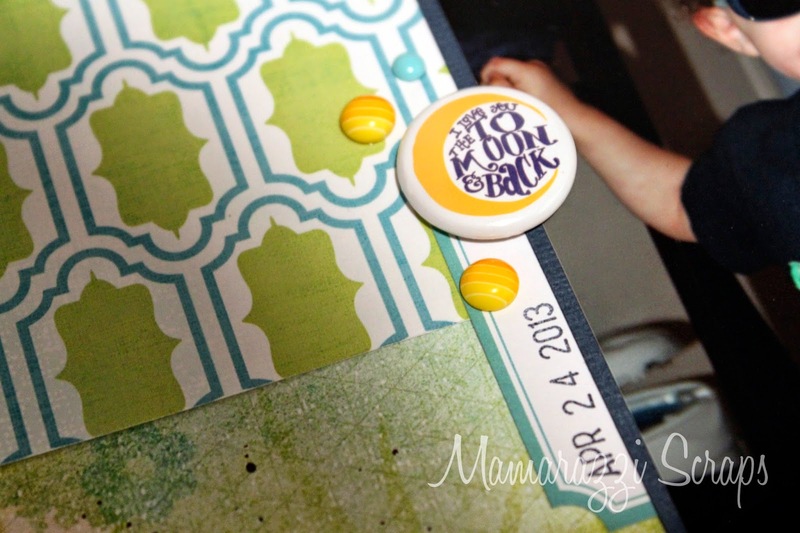 I am hoping to catch up on the Rose series from Scrapbook Steals before the deadline to enter. I still have two sketches to go, but I have until tomorrow, so I have hope. If you'd like to check out this sketch, please do so here. I am not 100% in love with how this layout came together, but you can't win 'em all, I suppose. It's another memory documented and THAT is what is important. The main reason I don't love how this layout turned out was that I just couldn't get my embellishments to come together in a way that I like. Also, the downside to working mostly with a main kit rather than having add-ons included when there is a a very narrowed down color scheme (this one is navy, yellow, teal, and lime green) means that it feels like everything starts to look the same after a while. The upside to working within a kit is that I was able to use a lot of my scraps. I keep things as they come (collections usually stick together, but if it's a monthly kit, that stays together as well) and because I often find it hard to work with a collection in a short time frame and avoid things looking the same, I don't end up touching my scraps. Sooo, that is definitely something I feel accomplished with even if I've only done 3 layouts with this kit so far. That's 2 more than I usually do with a kit the month it's released, if I touch it at all right away. Another positive I see here is that I got to use the Studio Calico paper as a background. I wanted to cut into it for my last layout but I just knew it would make a good background, so I set it aside. I think it looks great here. I tried to use as much yellow as possible in my embellishments since there is that tiny bit of yellow in the bottom left of the paper and in the paper strip layered under the title. I originally used a journaling card from the Cocoa Daisy Day In The Life cards (I bought just the cards rather than the entire kit and just did the same for May's kit as well) but there wasn't enough yellow in them and what yellow they did have was just too bright for the layout. 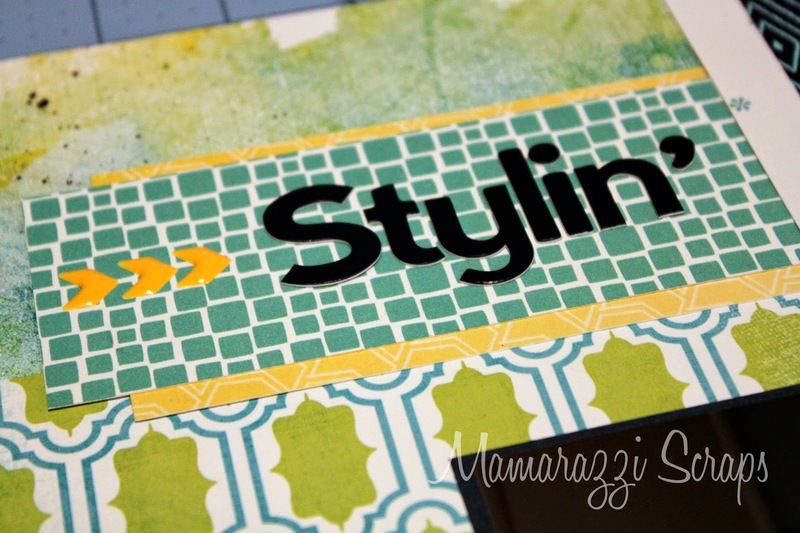 Instead, I found a random Studio Calico kit card from a stack I had in my Project Life organizer (blog post here) and it was subtle enough to not unbalance the top of the layout. I am still loving this Jillibean Soup Beanboard alphas (in navy...it might look black here, but due to the time of day I took the photo, when adjusting for poor lighting in photoshop, it tends to make dark colors even darker) but the title was a bit too short to properly balance in the space allocated, so I added a few of the arrows from the Doodlebug shaped Sprinkles that came in the kit. Here I used a flair that I made (this is a personal use item, not for sale as I do not own any rights to this image) as well as some Queen and Company pieces. I think they are jawbreakers. I can't remember who made the blue one. The label is from the Sn@p label sticker set and the date stamp I used was my trusty 2010's date roller from October Afternoon. I had inked this pair of resist glasses as a potential option for an embellishment in a layout I made the other day and it just so happened to work here. When I remembered this piece, it was about the time that I realized I had done two layouts that featured some type of glasses in a very short time frame. 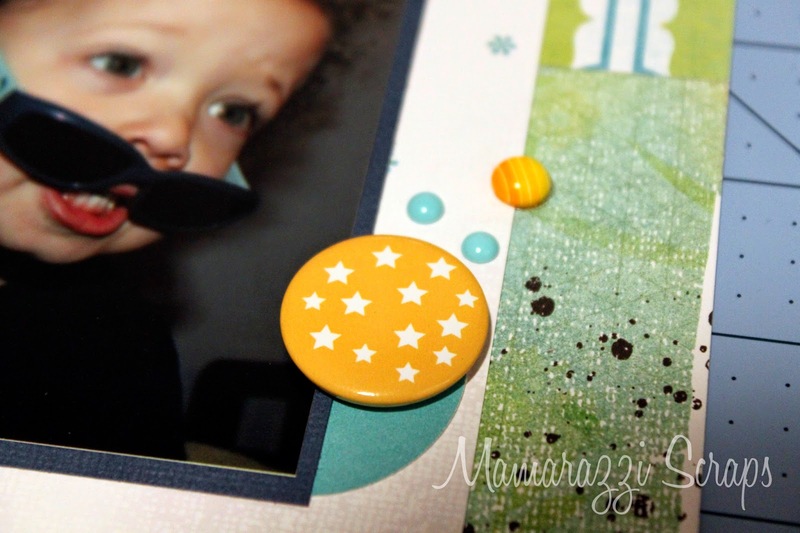 I just grabbed cute photos that worked with the sketch. I am just happy I didn't use the same kit for both layouts, haha. 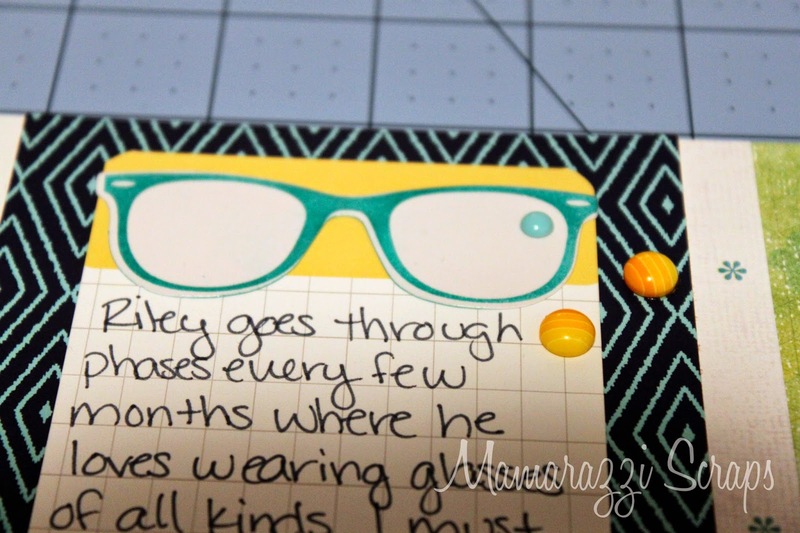 The card underneath is intended to be a speech bubble, but since they really aren't my thing and the glasses were big enough to cover them, I strategically placed it so that it would just look like a yellow band across the top. 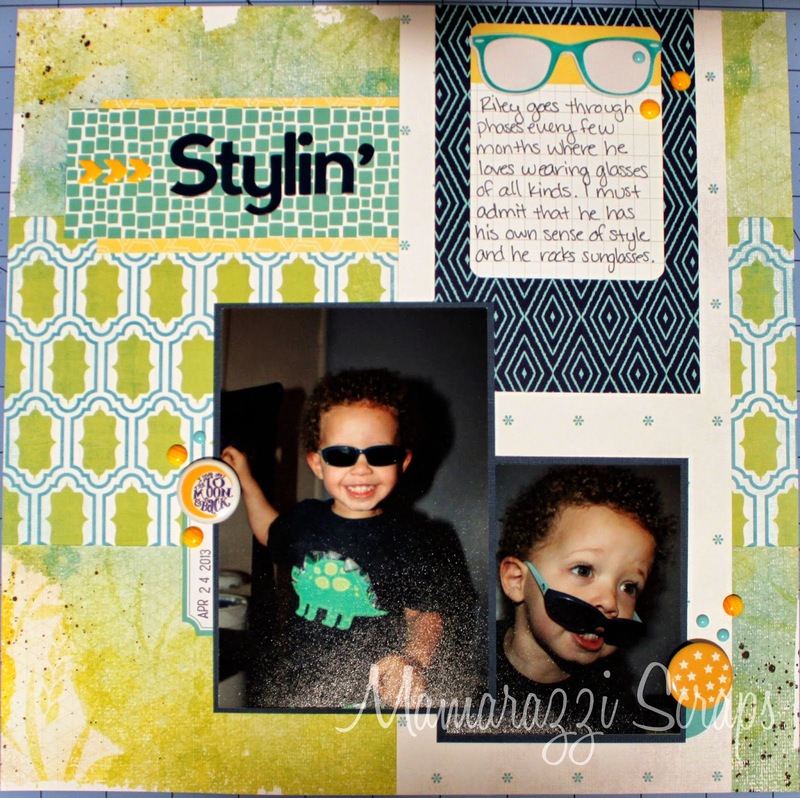 The journaling was pretty simple and just explained that my 3 year old has phases where he likes to play with glasses of all types and that he knows how to rock them really well.